Dimensions 1 by 7 by 10 in. Any organization's key accounts are its lifeblood. Key Account Management puts forward a unique yet straightforward planning methodology for identifying, obtaining, retaining and developing key customers.Â Â Key account management focuses on the long-term investment of resources -- both in terms of product quality and account managers -- into a customer that can offer an exceptional return on resources.Â But which are the key accounts? Are they the ones growing the fastest? The ones who are most financially secure? Or are they the ones who shout the loudest? 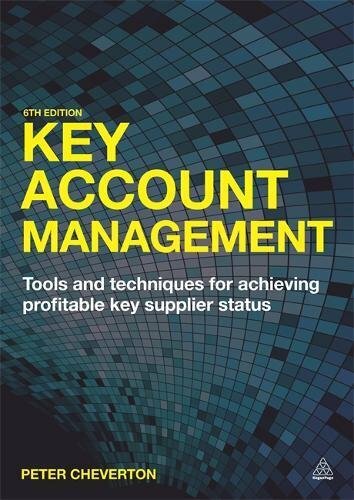 Now in its sixth edition, Key Account Management takes a long-term, team-selling strategic view of the whole process -- from defining the customer, to managing the relationship and achieving key supplier status. With new material to reflect latest best practice, and new online resources, it stands alone as the premier book on managing key customers.